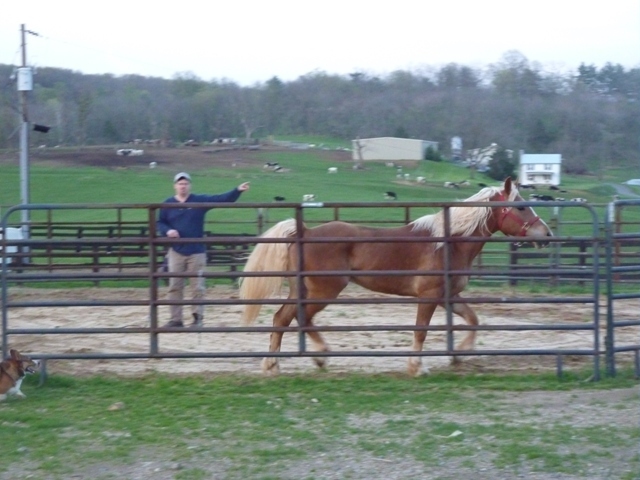 We have other geldings with different skill sets available for anyone’s price range in addition to the ones featured below. 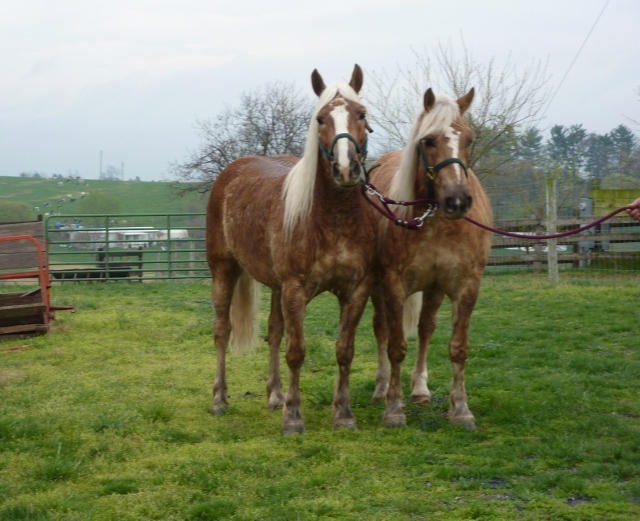 Please contact us if you wish to learn more about those horses. 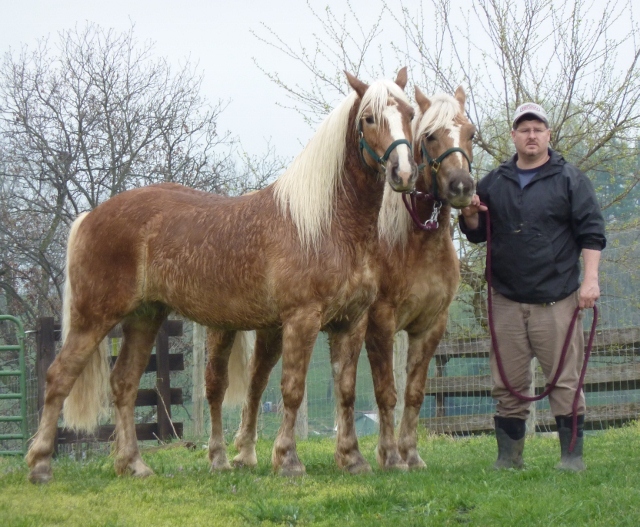 “Andy” is a registered 14 h Haflinger gelding with looks and style! 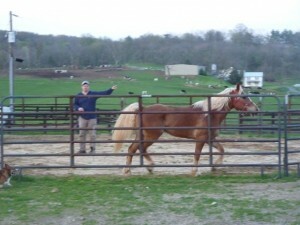 He is a very versitile horse with a sweet and loving personality. Does well with children. Since we have owned Andy, he has been trail riding, exposed to some cattle working and has had many driving miles put on him in both single and double hitches. 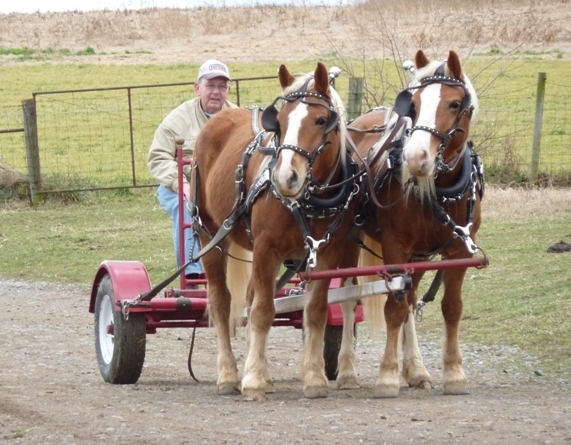 He has been a major part of our four horse hitch for the past two years, which has included participation in many different driving events across the East Coast. Video of Andy in action is available. “Augustus (Gus) Rock” and “Andy Rock”, pair of Haflinger geldings. 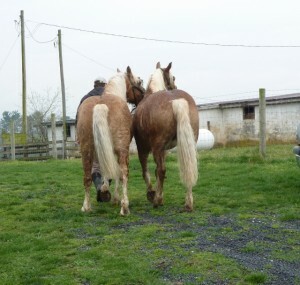 These geldings are 6 years old and are ¾ brothers. They were -sired by Haflinger Stallion “A Rock”. These boys were born 4 days apart and have been together since birth. They are broke as a team to drive and are currently in training now for riding. They stand 59 inches tall. Will sell as a pair. “The Perfect Team”. 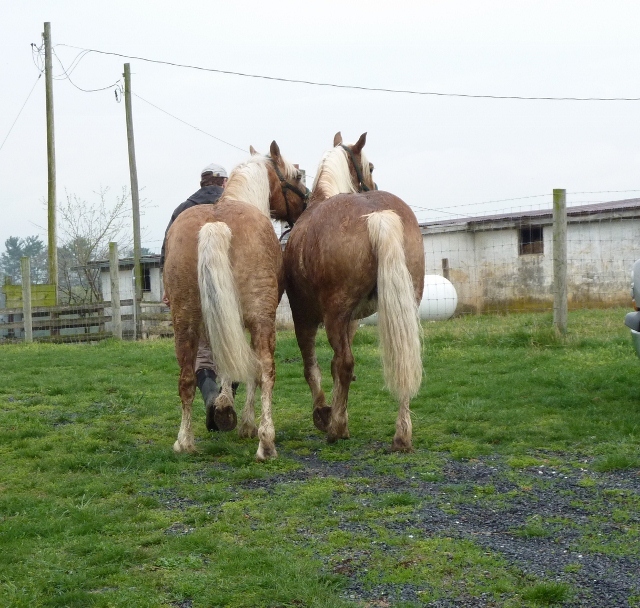 This team is comprised of two geldings…”Mr. Mac” and “Charlie”. They can truly do it all and we would love the opportunity to show off their talents to a new owner. Mac doubles as a “kids type” horse and Charlie has all the heart. We have put many miles trail riding in the mountains on them. They have participated in many events in the past four years up and down the East Coast. 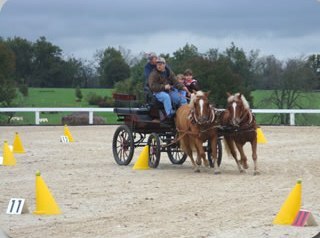 These events include parades to CDEs (Combined Driving Events). 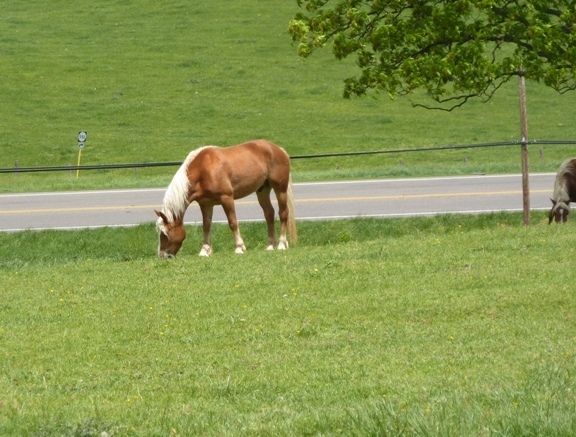 These horses have been exposed to all types of situations and will happily do what is asked of them. 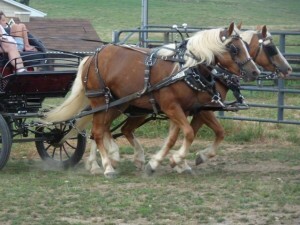 They are broke to drive single, double, four horse and unicorn hitch. Charlie is your lead horse. They both stand untied while being harnessed or saddled which can make hitching a breeze. These boys will make anyone a good teamster! They will only be sold to a good home! Will feature some photos soon, but please browse our website under “News and Events” tab, Previous Events and you will find many photos of them in action. We also have some video available. “Jemima” is a nice polled cow. She has been a part of our herd for a couple of years. If you are looking for that deep, red color, that is what she produces. A good mother and all around a great addition to any herd. 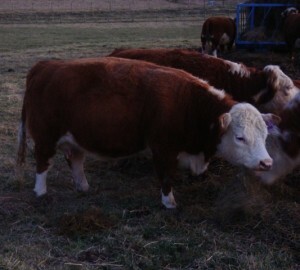 She has been bred back to a nice, OOOO, polled bull. “Tess” is a OOO horned cow. She has good color and has been a good mother. She is bred back to a OOOO polled bull. In addition to the featured heifers listed here, we have 3 other young heifers available now. They are priced at $2,500 each. 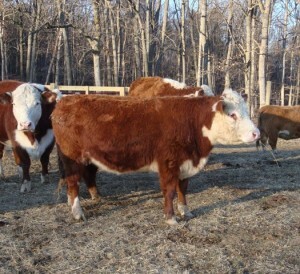 We also have some two year old bred heifers who have been bred to a OOOO polled bull. They are priced at $3,800 each. Photos of these animals are to come! 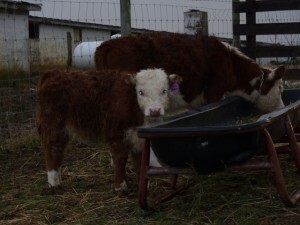 One of our smallest polled heifers we have had. Expected to finish at a OOOO frame score. Ready for a new owner.